Cepelinai (singular - cepelinas) or Didžkukuliai are a Lithuanian national dish. 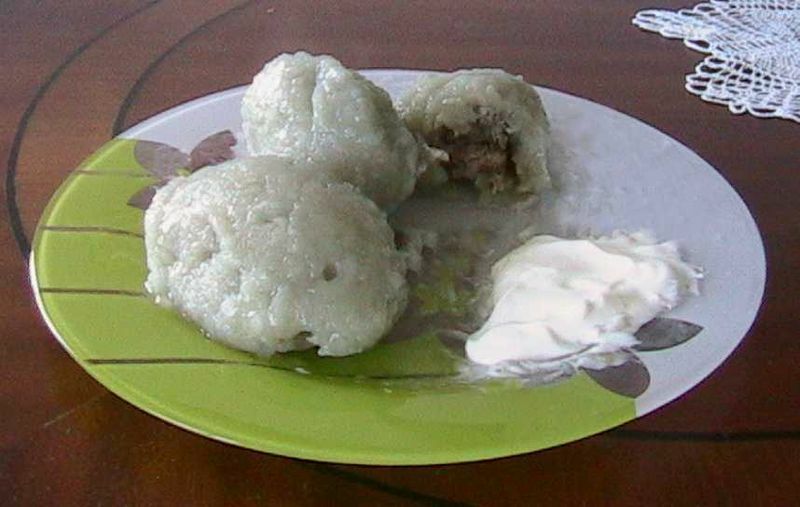 They are a type of dumpling made from grated potatoes and usually stuffed with minced meat, although sometimes dry cottage cheese (curd) or mushrooms are used instead. Left: Cepelinai (potatoes dough filled with meat). So named because their shape resembles that of a Zeppelin airship, cepelinai are typically around 10–20 cm long, although the size depends on where they are made: in the western counties of Lithuania cepelinai are made bigger than in the east. Cepelinai are eaten with bacon, or melted sour cream and butter sauce. This dish is very filling, and was traditionally only served for guests or during heavy work seasons. dry cottage cheese (curd) or mushrooms can be used. Peel and grate raw potatoes using the smallest side of the grater, then squeeze out excess liquid from them thoroughly through a cheesecloth. Let the starch settle to the bottom of the liquid, then pour the liquid off and add the starch back to the potatoes. Peel and mash the boiled potatoes, then add them to the grated ones. Add a dash of salt and knead the mass well. Take approximately egg-sized pieces of this mixture and form into patties. Place spoonfuls of the previously prepared filling into the center of the patties. Most often a filling is made from ground beef, dry cottage cheese or mushrooms with salt and spices. Close the patties around the filling and form them into oval shapes. Bring a saucepan of water to a boil. Reduce the heat of the water just before adding the cepelinai from a rolling boil to a simmer. Place the cepelinai in salted boiling water and simmer for approximately 30 minutes. Carefully stir the pot so that the cepelinai do not adhere to the bottom. After boiling, the cepelinai are served with sour cream sauce and bacon or pork rinds.